Yemenite poet and cabalist; flourished toward the end of the seventeenth century at Ṭa'iz, a city ten days' journey south of Sanaa. He was a weaver by trade, but occupied himself also with cabalistic literature, especially the Zohar and the "Shi'ur Ḳomah." He wrote poems both in Hebrew and in Arabic, many of his hymns having one half of each verse in one language and the remaining half in the other. Most of the liturgical hymns recited by the Yemenite Jews on the Sabbath and on holy days, as may be seen from Neubauer, "Cat. Bodl. Hebr. MSS." No. 2377, were composed by Shalom. But, like Israel Najara, he wrote also many love-songs with a mystical tendency, some of which, in Hebrew, were published by Jacob Saphir in his "Eben Sappir" (i. 82b-87b). David Günzburg published in the "Steinschneider Festschrift" (Hebrew part, pp. 95 et seq.) an Arabic dirge composed by Shalom in 1687 on a catastrophe at the Yemenite town of Mauza'. This dirge, of the "muwashshaḥ" class (a poem with double rimes), was taken by the editor from Shalom's "Diwan", then in his possession. 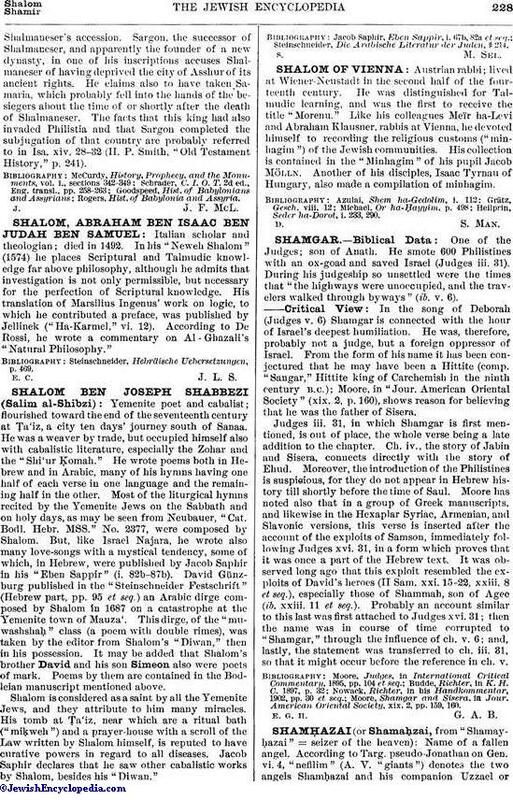 It may be added that Shalom's brother David and his son Simeon also were poets of mark. Poems by them are contained in the Bodleian manuscript mentioned above. Shalom is considered as a saint by all the Yemenite Jews, and they attribute to him many miracles. His tomb at Ṭa'iz, near which are a ritual bath ("miḳweh") and a prayer-house with a scroll of the Law written by Shalom himself, is reputed to have curative powers in regard to all diseases. Jacob Saphir declares that he saw other cabalistic works by Shalom, besides his "Diwan." Steinschneider, Die Arabische Literatur der Juden, § 214.